The Yellow-billed Kingfishers (Syma torotoro) are widespread throughout lowland New Guinea and adjacent islands, extending to Northern Cape York Peninsula in Australia, where they inhabit mangroves and rainforests. These birds are quite inconspicuous, preferring to live in the lower levels of inaccessible rainforests and mangroves where their food supplies are plentiful. These medium-sized tree kingfishers measure about 20 cm in length, have a wingspan of about 29 cm and weigh about 40 g). Their bodies are unusually configured. They have stocky bodies, large heads and long, thick, sharply pointed bills, shaped like a dagger. The bill seems disproportionate to the rest of the body, but it is designed for impaling and capturing its prey. Their legs are short and their tails broad and stout. Their strong feet support them while perching on branches. The Yellow-billed Kingfishers are easily recognized by their prominent yellow bills and the black eye rings. The neck and head is orange, except for a black nape patch and white throat. The upper mantle is blackish grading to olive green on back, andblue-green on the rump. The tail is blue. The upper wing coverts are dull green-blue and the flight feathers are dark olive-black. The plumage below is pale orange-grey. The male’s head is completely orange. The adult female has a black cap and black upper mantle, which changes to green on the back and blue-green on the rump. Juveniles have dark grey bills. Kingfishers kill their prey by beating them on the ground or perch to shatter the bones. Kingfishers are highly territorial birds. They will locate a prime area based on food sources, desirable perching trees and safe roosting sites. Like most birds, they will search for their food in the mornings and evenings. If the weather is cooler, they will also hunt for food during mid-day. Cleanliness is important to Kingfishers; they will dive into the water to bathe, then fly to a perch to preen and dry their feathers in the sunlight. Some will even clean their heads using their wings. They will utilize a branch to clean their impressive bills, keeping them in excellent condition by scraping them back and forth. 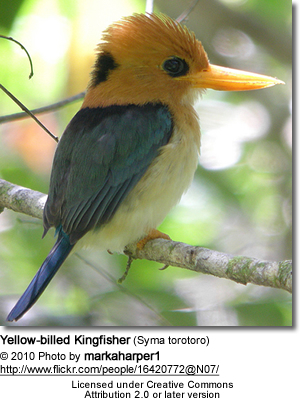 Like many Kingfishers which dwell in the forest, the Yellow-billed Kingfisher (Syma torotoro) often use excavated chambers in abandoned arboreal termite nests (termitaria) for raising their young. The average clutch consists of 3 - 4 white eggs and the incubation is shared by both parents. Hatchlings are altricial and require feeding by the parents, who bring the food into the nesting chamber. The young develop fast, and soon the chicks are able to travel toward the entrance of the tunnel where they encounter the adults and wait to be fed. Eventually, they are fed on a perch near the entrance. Fledging can last a few days to a few weeks. After that, the young will be on their own and will feed themselves. During breeding season, a series of repeated whistling trills can be heard.